After the Gen Art Shop NYC event, I headed over to the Housing Works Thrift Shops sale in Chelsea, hosted by celebrity stylist Robert Verdi. The event was being taped as part of the docu-series The Robert Verdi Show Starring Robert Verdi. 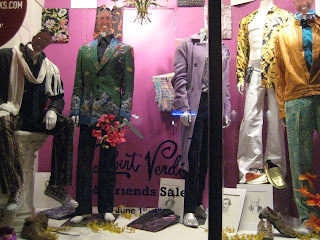 Over 1,000 items were donated by Robert Verdi & friends, including Jonathan Adler, Steven Alan, John Bartlett, Bobby Berk, Brian Boye, Collin Cowe, Patrick Doddy, Simon Doonan, Jamie Drake, Rodney Keenan, Carson Kressley, Richie Rich and Nathan Thomas. This was the first Housing Works Thrift Shops sale I’ve been to and although I wasn’t able to find anything in my size or fit (size XS or 0 is hard to come by at one of these events), I saw a ton of people enjoying themselves and picking up some great finds. One of my friends was able to find three blazers all for $70. These are definitely one of those events where you want to get there early! Donations to Housing Works Thrift Shops help raise more than $10 million annually in support of homeless men, women and children living with HIV and AIDS in NYC.